Fitness Factory co-owner Andy Berman and teammate Emily Bass knock out push-ups at the gym Saturday in a Push-Up-Athon to raise money to send sick children to the Hole in the Wall Gang Camp this summer. The push was on at Fitness Factory Saturday morning to raise enough money to send 10 sick children to the Hole in the Wall Gang Camp this summer. 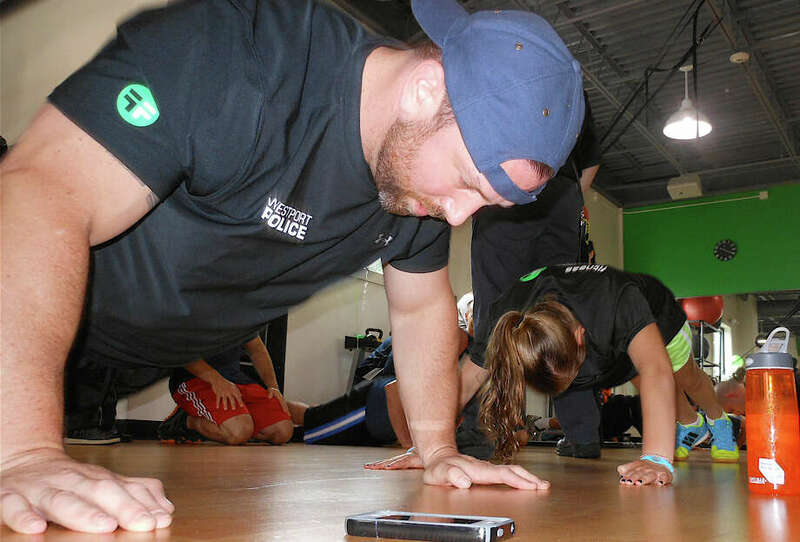 About 30 people competed in the gym's annual Push-Up-Athon, an event first begun shortly after the center opened on Post Road East in 2009. Competitors collected pledges of support, and the proceeds benefitted the camp founded by the late actor and Westport resident Paul Newman. The camp was founded by Newman to provide a summer get-away for children with cancer and other serious illnesses. The Westport Fire and Police departments, along with a group of workmates from Cushman-Wakefield Real Estate, fielded teams for the event. "We wanted to do something important and give back, start off strong, put our muscles to use," said Andy Berman, gym co-owner along with Mary Sue Teplitz, about initiating the push-up fundraiser in the first place. Berman was competing in the challenge with teammate Emily Bass. Each participant had their own "scorer" as they strived to do as many push-ups as possible the two-hour event period. Trophies were awarded to the team with the most push-ups and overall best individual effort. Berman's goal was 2,500 push-ups, representing the $2,500 cost to pay for a one-week camp session for one child. Last year, the event raised more than $19,000.